1. DQ Blizzard ice cream. 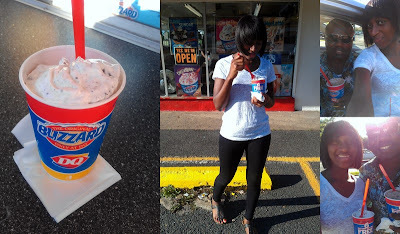 Yesterday, Mr. D. and I decided we needed to make an Ice cream run midweek just because. It was a great idea and I enjoyed every last bit of the blizzard. I think the only thing we'll change next time is to get a small instead of a medium. Although it was all good, it was a bit much, but no guilty feelings at all, at least for me, hubby felt a bit bad about consuming all that calories. It was fun and refreshing eating ice cream in the parking lot while sitting on the car and we weren't the only adults there either. Goes to say ice cream pleasure knows no age. 2. For the beach. Can't wait to be lying on the sandy beach this Saturday soaking up the sun and enjoying beautiful nature. It's been months since I was at a beach, so I'm excited about going this weekend and having a mini road trip as well. 3. SYTYCD (So You Think You Can Dance) If you are not currently watching this show, this is one show I will definitely recommend you start watching. The performances are flawless, the choreographers are brilliant and the talent is out of this world. I love this show and I've been watching it since the very first season, in fact it's the only show on my weekly schedule for the season. I love that it doesn't get old, because there is always something or someone that makes the whole season unique. I'm sad some certain people didn't make it into top 20, but there can only be 20 people, right? I guess they made up for that in a way because there will be two winners this season; a girl and a guy. I'm so excited for this season and the contestants that made top 20, definitely a unique and diverse bunch, can't wait to see how the season unfolds.